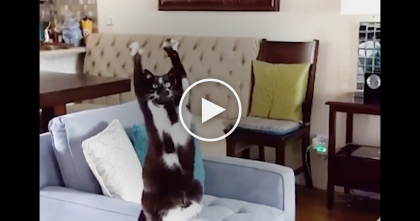 He’s recording his cat, but when you hear the cat’s “laughing”… It’s the CRAZIEST thing I’ve ever heard! This Siamese cat has the craziest “laugh” you’ve ever heard… I’m honestly not sure what to say, and some skeptics think it’s “fake” but we’ll leave that up to you! – This sounds so human-like we almost can’t believe it! Although some people think this is actually a human laughing over the video, some Siamese cats do make this similar sound and we’ve posted such videos before, however we’ve never heard anything like THIS before! 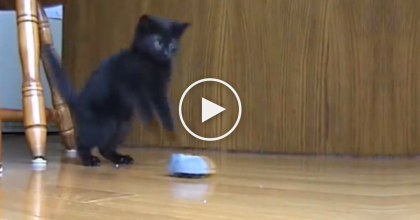 You won’t believe the sound this cat makes… Turn your volume up and watch this video! This is the CRAZIEST thing I’ve ever heard—SHARE this story with your friends if you enjoyed! 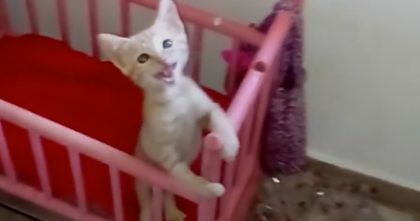 Kitten Jumps Into Baby Crib And Starts Meowing For Human… Now Watch What He Does Next, Awwww!!! 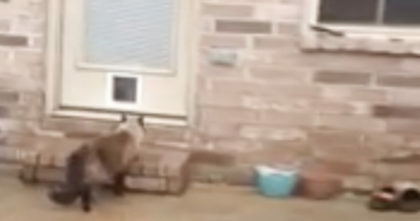 He bought a new cat door for his kitty, but keep watching till 0:29… This is hilarious, oh my!! See This Kitten? 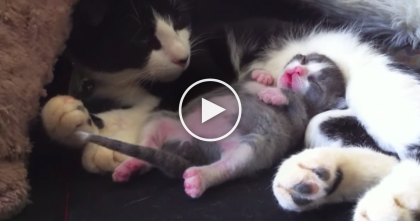 You’ve Got To See What Happens When He Starts Dreaming… Oh My!